MPs and campaigners said last night that the high street giant’s dismissive attitude towards these customers highlights the ‘dirty culture’ which still exists in banks. Lloyds – which was rescued by taxpayers during the financial crisis – has been mired in a string of scandals. Its compensation bill for the PPI mis-selling scandal alone soared above £13billion. Yesterday it revealed it had been forced to set aside another £1.4billion to compensate customers mis-sold payment protection insurance. But it still made a profit of £1.2billion in the first half of the year – a 38 per cent jump on the same period last year. The internal email sent in June to staff at ten branches in the North East suggests the bank has little interest in customers who will not further boost its profits. The unnamed line manager berates employees for not selling enough mortgages, adding ‘the commerciality of your appointments is crucial to our success as a team and individually’. The manager adds: ‘Please review your forward diary for the rest of the week – and pre-qualify all appointments to ensure we are seeing customers who need and want our help for their largest financial commitment. An aggressive sales culture landed Lloyds with a £28million fine from the City watchdog the Financial Conduct Authority in December 2013. The situation had got so out of control that it handed its most prolific salesmen ‘grand in the hand’ bonuses and bottles of champagne. The bank, which has 30million customers in the UK and owns Halifax and Bank of Scotland, claims to have reformed and has pledged to become the ‘best bank for customers’. As part of a major overhaul under chief executive Antonio Horta-Osorio it ditched old-fashioned sales targets at the start of this year. It says bonuses are now based purely on feedback from customers. Ditching the targets has led to a dramatic slump in sales of credit cards, insurance loans and mortgages this year. Critics suggested the leaked memo indicates the bank is beginning to panic and is cranking up the pressure on staff to sell more. Lloyds yesterday admitted it has been forced to set aside £175million for another mis-selling scandal, where customers were lured into paying for expensive ‘packaged accounts’ with perks such as travel insurance they may not have needed. Mark Garnier, a Conservative member of the Treasury Select Committee, said: ‘The general mood music is one of bad old business as usual, with shareholders now putting pressure on banks to perform better. 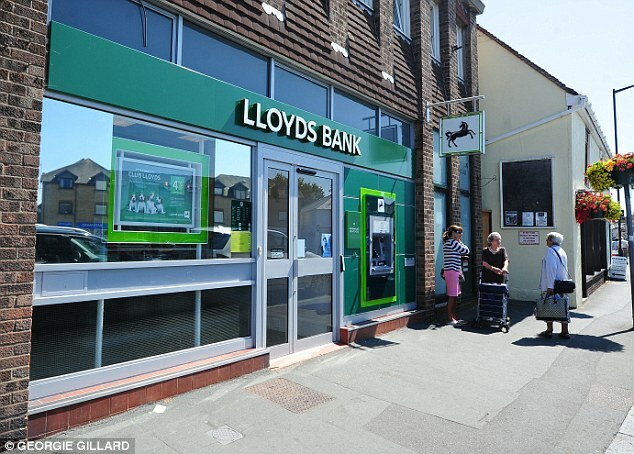 A Lloyds Bank spokesman said: ‘Our advisers are here to support customers. If a customer wants to speak to someone in a branch, they can. ‘However, if this process isn’t managed efficiently it can be unnecessarily time-consuming, which is not a good customer experience.